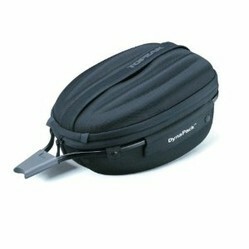 This small, underseat bike bag may just spoil you. What is the biggest drawback to bicycle commuting? Its that bikes don't have a good way to carry all of your crap from one location to the next. I remember as a kid, trying to ride with a plastic bag hung over the handlebars. Needless to say, it wasn't the safest way to ride. A full bike rack and panniers can be too bulky and costly. 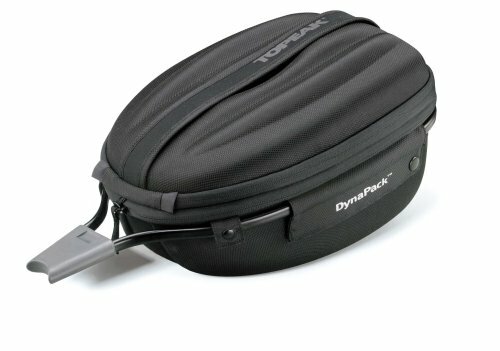 The Topeak Dynapack DX is probably the largest bike bag you can get without installing a full rack . I love Topeak bags. They make some of the best racks and bags and baskets in the world of cycling, and may be single-handedly responsible for turning many people into serious fans of commuting for daily purposes. The Dynapack DX is a great example of this. It mounts under your seat and has a huge amount of space -- so much space that you can put a bike helmet in it! It even has an expansion section that you can unzip to allow a little more storage space. It can provide up to 590 cubic inches of room. It comes with a rain cover so if your sunny April morning gets wet on your ride home, you can keep that extra change of clothes you brought along dry. And, when you get to your destination, you can easily unclip the bag to take your belongings with you. Of course, Topeak thought of that, too. It comes with a carrying handle so you are not wrestling with it. And, if you get too addicted to commuting, you may find that you want to upgrade to the one of Topeak's real rack installations. However, for someone who isn't hard-core about commuting, but wants to have ample storage space for those trips where they do plan to commute or even just go on a long Sunday bike ride, the Dynapack DX is a hard one to beat. So, if you are looking for a bicycle trunk that is heft without being overpowering, the Topeak Dynapack just might be the one to check out. It always happens. You are miles from home, enjoying a wonderful bike ride, when the darn wheel goes flat. What do you do now? Whoever invented CO2 Inflator for emergency bike tire repairs should be given an award. Maybe Knighthood. Here is my favorite CO2 Inflator.